In collaboration with the Jazzschool, we present a tribute to the late legendary Bay Area drummer Eddie Marshall featuring many of the original players from his hard-swinging band of the early ‘90s—Peck Allmond (trumpet and saxes), Kenny Brooks (tenor sax), Mark Levine (piano), and Jeff Chambers (bass) as featured on the Bay Area Jazz Archives double CD, Eddie Marshall: Jazz at Filoli 1992—plus Akira Tana on drums. 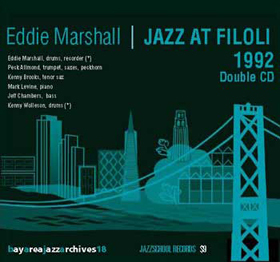 Coming from a family of musicians in Springfield Massachusetts, including his grandfather Joseph “Kaiser” Marshall who played drums with Louis Armstrong and Fletcher Henderson, Eddie was a leading figure in the evolution of San Francisco's contemporary jazz sound. For more than 50 years he played with nearly every major name in jazz, from Freddie Hubbard, Jon Hendricks, and Dexter Gordon to Rahsaan Roland Kirk and Eddie Harris. His most long-standing musical associations were with Toshiko Akiyoshi, the late Stan Getz, Bobby Hutcherson, and Bobby McFerrin. Eddie also distinguished himself as a composer, creating music of driving intensity and joyous, melodic lyricism, such as his signature composition "Dreams That Dance: A Suite." Proceeds from tonight's concert benefit the Jazzschool's Eddie Marshall Scholarship Fund. The fund, created when Eddie passed away last fall, will support drum students of all ages and levels based on a combination of merit and need.